Darcy Smith always sensed she was different from everyone else–if only she knew how different. 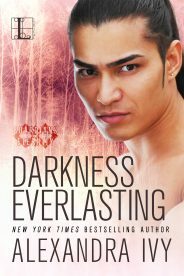 Possessing a secret strong enough to end an entire race of demons, Darcy unwittingly becomes a pawn in an epic battle between the vampires and the Weres as she discovers a new world filled with ecstasy–and dark passions. Salvatore Giuliani knows time is running out for the Weres. Pushed to the brink of extinction, he will stop at nothing to make Darcy his ultimate conquest and queen–for she alone holds the key to his survival. But which of these men can Darcy trust? For all it takes is one bite to plunge her into a lifetime of servitude–or a lifetime of pleasure. As far as nightclubs went, the Viper Pit was by far the most expensive, the most elegant, and the most exclusive in the entire city of Chicago. Oddly enough, it was also the most obscure. There was no listing in the phonebook. No gaudy ads on billboards, or flashing neon lights to reveal its location. In fact, the entire building was hidden behind a subtle glamour. Anyone who was anyone knew how to find the place. And those anyones didn’t include humans. Moving among the marble pillars and glittering fountains were various demons, all indulging in a variety of nefarious activities. Gambling, drinking, exotic dancing, discrete (and not so discrete) orgies. All of which cost a small fortune. Delicious pastimes no doubt, but on this cold December night the vampire known as Styx was not interested in the activities available below the private balcony. Or even in the various demons who paused to perform a deep bow in his direction. Instead he regarded his companion with a measure of resignation. At a glance the two of them couldn’t have been more different. Well, that wasn’t precisely accurate. After all, they were both tall and blessed with the muscular bodies of all vampires. And they both possessed dark eyes and the prerequisite fangs. But that’s where the similarities ended. The younger vampire, Viper, had come from the northern Slavic lands and possessed the pale silver hair and even paler skin of his ancestors. Styx, on the other hand, had come from the hot lands of South America, and even after his transformation maintained the bronzed skin and proud angular features of the Aztecs. Tonight he had put aside his traditional robe and chose black leather pants, thigh high boots, and black silk shirt. He had assumed the garb would make him less noticeable as he traveled the streets of Chicago. Unfortunately, there was no means for a six foot five vampire with raven hair braided to his knees to go unnoticed. Especially from the mortal women who held no defense against the thrall of vampires. He had gathered nearly a half a dozen adoring females as he had walked through the dark streets. At last he had taken to the rooftops to avoid their persistent attentions. By the gods, he wished he could have stayed hidden in his caves, he acknowledged with a sigh. For centuries he had lived the life of a monk as he had protected the Anasso, the leader of all vampires. He had been an enforcer and guardian, rarely leaving the ancient vampire’s side. With the Anasso now dead he was being forced into the role of leader, and he was discovering that he could hide no longer. Not when there was one trouble after another plaguing him. It was enough to annoy the most patient of demons. Realizing he had allowed his attention to wander, Styx abruptly straightened in the plush leather chair. By instinct his hand lifted to touch the bone medallion tied around his neck. It was a symbol of his people. More than that, it was believed to be a means of passing spirits from one generation to another. Of course, as a vampire Styx had no tangible memories of his life before rising as a demon. That didn’t, however, keep him from holding onto at least a few of his more sacred traditions.